A couple of days ago I bought a HP tx1000 laptop, and I noticed something weird: everytime I was logging on to Vista the screen become black, and the computer appeared to do nothing for a very long period of time; eventually the desktop appeared and things got back to normal. I knew something was wrong and I was planning to run eventually some monitoring software to track this down. Fortunately, it was not necessary: Vista came to rescue. 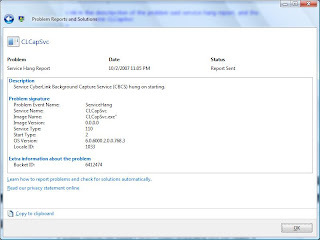 When I woke today the laptop from sleep the "Problem Reports and Solutions" dialog popped up, asking to send Microsoft a "Service hung report" for a "ClCapSvc" program. I had 7 of these reports to send, so I set to investigate further. "The CyberLink Background Capture Service (CBCS) service is marked as an interactive service. However, the system is configured to not allow interactive services. This service may not function properly." So, the mystery was solved. For me the service was installed as part of HP QuickPlay application, and it's used most likely for recording TV shows (and the other service for scheduling TV shows to be recorded as specific times). It's unclear to me why these services were intalled and automatically started, as I don't even have a TV tuner card! It looks like the service comes with other software like Cyberlink PowerCinema, that was probably licensed by HP and repackaged into QuickPlay. Other users had similar problems... http://www.vistax64.com/vista-hardware-devices/78245-cyberlink-background-capture-service.html. Solution 1: Disable the service. In Start menu, type and run Computer Management, select the Services node in the tree, and in the right pane select "CyberLink Background Capture Service (CBCS)". Right click the service, use Properties dialog to set the service to Disabled (Setting to Manual doesn't help, as during the boot some other crappy application will attempt to use the service causing it to start again). Ok the Properties dialog and repeat the procedure for the second service, CyberLink Task Scheduler (CTS). Solution 2: The version of the CLCapSvc.exe file on my machine was 5.0.2510, and it was part of Hp QuickPlay 3.2. HP offers on its website an updated version of the program, HP QuickPlay Web Update 3.20A. Uninstalling the old version and installing the new one upgraded the file to version 5.0.2819, which doesn't seem to hangup on boot. Thanks for your clear & precise description of the problem & solution. This was very helpful. thanks for ur valuable help! Thanks for this solution. I have been suffering for ages and hope that with your assistance the problem is resolved. Thank you for your help with such a clear, concise description of how to solve this super-annoying issue. Thank you very much for this fix! Thanks for very clear and precise instructions. the help it is really helpful. Am procedat conform indicatiilor. Excelente! Sper sa nu recidiveze. Multumesc mult.